Across the nation many sons and daughters of the Most High are either building new barns or restoring old barns to use for one sole purpose: to host the very presence of God. Many are coming out of the woodwork with such testimonies of the Lord calling them to a barn raising within their community. Are you one of these called ones? Join us May 17-19 as we converge on The Glasgow Farm in Fredericksburg, Virginia. 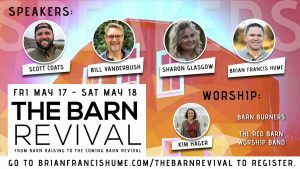 We will kick it off with a worship and intercession set in the prayer room at the Fredericksburg Prayer Furnace from 2-4pm to pray for the coming barn revival. The evening sessions are open to the public. The leadership at Awakening Community Church have kindly invited us to join them Sunday morning as we end the weekend. We want to extend this invitation to all to dream with the Father concerning what’s on His heart for this coming barn revival. Previous articles on the barn revival. We are coming! Love to have similar event here in Troy as well! I would like to register 2 people to attend the Barn Revival at the Glasgow Farm but can’t find where to do it. Let me know if you have any other questions. I am excited that you will be joining us. Where will you be coming from?